I’d visited a few Napa wineries a couple of months ago with my friend Jane and her cousin Mike. I wasn’t taking notes that day – it was just a relaxing day out – but we stopped at Lagier Meredith Vineyard, Vincent Arroyo Winery, Envy Wines / Carter Cellars, and Bennett Lane Winery. We enjoyed ourselves so much that we decided to get together again for another wine-tasting outing the next time that Mike was in town (he and his wife Carol live in San Antonio). Fortunately, it was less than a month before Mike was able to return, this time with Carol too. We were joined on this occasion by more friends – Laura, Ken and Grace, and Mark. Since we’d visited Napa wineries before, we decided to go to Sonoma this time. There were several newcomers in our group, so I arranged visits with a few winemakers who I knew from past experience would be especially entertaining hosts. It was a sunny but cold morning when we all met up in San Francisco. We managed to fit ourselves into two cars for the drive across the Golden Gate Bridge, through Marin, and into Sonoma County. Just north of Santa Rosa, we turned west toward the Russian River, then crossed it along the quaint old one-lane wide Wohler Bridge. From there it was only a couple of minutes to our first appointment of the day. We rolled up to the parking area at the Moshin Vineyards facility a few minutes early for our visit with Ispiri and Arista winemaker Leslie Sisneros. Leslie had suggested meeting there, as the Arista wines are currently made at the Moshin facility. Looking around, we found that all the doors there were closed, as the tasting room wasn’t scheduled to open for another 30 minutes. There were a couple of cars parked outside, though, so I took a walk around the side of the building to see if I could find someone to let us in. Someone was indeed there, and they’d heard me outside and opened the door for our group – we were all glad to step in out of the cold. Leslie arrived just a few moments later, and led us past the tasting room and into the gravity-flow Moshin winery. We walked from the bottom-floor bottling area up a set of stairs to the barrel rooms – the crushpad and fermentation tanks are located on a level further above that. Once we were all in the barrel room, Leslie set out bottles of three Ispiri wines for us to taste. 2007 “Maylena,” Alexander Valley: 88% Merlot, 12% Cabernet Sauvignon.Medium-dark color, showingblack cherry and raspberry fruit, with dashes of pepper and vanilla/oak. On the palate, this has very good acidity and balance, with almost dusty tannins on the finish. Very nice, with appealing upfront fruit plus the structure for cellar aging. 2007 Cabernet Sauvignon, Alexander Valley: 85% Cabernet Sauvignon, 15% Merlot. Darker purple color, with plum and black currant, herb/tobacco, and chocolate/oak aromas. There’s a lively minerally edge to the wine, and it finishes with tannins that are big but not harsh. A bold mountain Cabernet that deserves some time in bottle to show its best. 2008 “Cuvée Franc,” Sonoma County: 73% Cabernet Franc, plus Petit Verdot, Malbec, and Cabernet Sauvignon. Medium-dark color, showing darker berry fruit along with herbs and a distinctive savory streak that sets it apart from the two ’07 wines. Big and bold on the palate, with some sweet oak and grippy tannins on the finish. Still a baby, this will take some time to come into its own. 2009 Pinot Noir, Corona Creek Vineyard, Sonoma Coast: (Tasting note from August 2010) Just bottled a week before the tasting, from 115 clone. Medium color, this shows some pretty floral notes along with black cherry fruit, not surprisingly a bit muted from the recent bottling. Medium-bodied with good acidity, given time this should develop nicely in bottle. 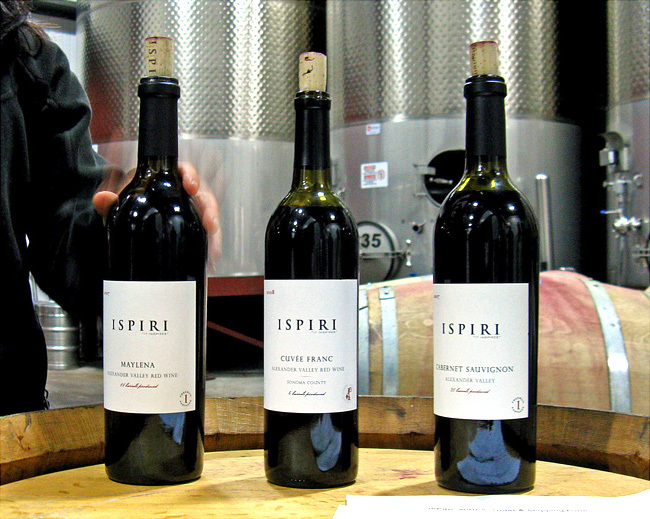 The Ispiri wines are made at the Mauritson facility in Dry Creek Valley. Most grapes are sourced from the rocky volcanic and sedimentary soil above Alexander Valley on Pine Mountain (part of the Mayacamas Mountains), but some fruit is also coming from the Rockpile AVA near Lake Sonoma. Total production in 2007 was around 700 cases, and Leslie told us that this has gone up to 1,800 cases for the 2009 vintage. 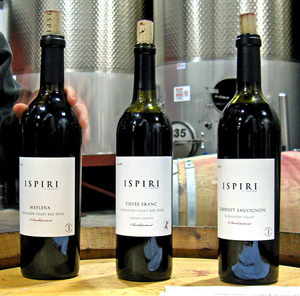 The earlier bottles were modestly big and heavy, but with the 2008 vintage, Ispiri has gone to a lighter-weight bottle. The 2007 “Maylena” blend – mostly Merlot plus some Cabernet – is named for Leslie’s two daughters, Maya and Elena. The 2007 Cabernet Sauvignon was sourced from several vineyards on Pine Mountain, blending together different Cab clones grown on different soil types. Both the “Maylena” and the Cabernet were barrel-aged for 20 months, using approximately 50% new and 50% neutral French oak. Leslie likes to use a good percentage of new oak in the Ispiri wines, aiming for some chocolate / mocha notes in the flavors. Both the 2008 “Cuvée Franc” and 2009 Pinot Noir were bottled late last summer, and plans are to release them before too long – though the case production of these wines was small so there may be limited availability. We tasted the “Cuvée Franc” with Leslie, and I’ve included a note on the Pinot from last August’s Family Winemakers tasting in San Francisco. Overall, I’d describe the character of the Ispiri wines we tasted on this occasion as big and intense but not heavy. I think the use of mountain-grown fruit has a lot to do with that character. This was an excellent demonstration of the fruit sources and the winemaking style being a good match for one another. The “Maylena” was my favorite, though in time the Cabernet or “Cuvée Franc” could surpass it. Leslie has displayed her talent with the latest Ispiri wines, and we should see more fine wines from this label in the future. Before we left the Moshin facility, Leslie asked us whether we’d like to taste a couple of barrel samples of Arista Pinot Noirs. I could see everyone’s eyes light up at the offer! Notes on those barrel samples are included in the next section on Arista Wines. After our tasting, we all piled back into our cars and drove a few miles up scenic Westside Road to the Arista tasting room, in the heart of Russian River Valley. 2010 Pinot Noir, Toboni Vineyard, Russian River Valley (barrel sample): 667 clone, from a new Mercurey barrel. Medium ruby color, black cherry and plum fruit with some cola and sweet oak undertones, deep and lush, great purity of fruit with mild tannins, a spot-on example of Russian River Pinot. 2010 Pinot Noir, Perli Vineyard, Mendocino Ridge (barrel sample): Medium-dark color, showing bright strawberry and other red fruits, lively mouthfeel and finish. 2010 Gewürztraminer, Ferrington Vineyard, Anderson Valley: Just bottled a few days earlier. Very light straw color, bright citrus, lychee, and spice aromas, zippy acidity, and a clean finish without the bitter note I often find in Gewürz, quite nice. 2008 Pinot Noir, Russian River Valley: Medium-light color, displaying bing cherry, cola, vanilla, and hints of smoky oak and spice. Bright and a little tangy, this was a lighter-weight Russian River Pinot with just a touch of tannin on the finish, a good Pinot to drink now. 2008 Pinot Noir, La Cruz Vineyard, Sonoma Coast: Slightly darker color, showing black cherry and plum with an overlay of spicy oak. Juicy acidity and firmer tannins give this wine good structure for at least some short-term bottle age. 2008 Pinot Noir, Bacigalupi Vineyard, Russian River Valley: Medium-light color, with cherry, dried herb, and pepper aromas. Lively mouthfeel and more tannic on the finish, quite a distinctive and attractive Pinot. 2008 Pinot Noir, Toboni Vineyard, Russian River Valley: Medium ruby color, deeper black cherry and raspberry with cola, spice, and mineral notes, framed nicely by sweet oak. The fruit is richer and the mouthfeel is rounder than the other Pinot bottlings – as with the barrel sample, this is the very definition of Russian River Pinot. 2008 Zinfandel, Smokey Ridge Vineyard, Dry Creek Valley: Medium-dark color, ripe and jammy berry fruit with hints of chocolate and flowers (sounds perfect for Valentine’s Day!). Fairly big and rich on the palate, with moderate tannins on the finish. 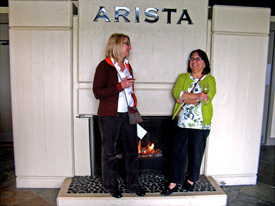 I wrote about Arista back in May '09, so I won’t go into too much detail here. Founded by the McWilliams family in 2002, Arista is best-known for their Pinot Noir. They produce a number of Pinot bottlings, along with smaller amounts of Pinot Gris, Gewürztraminer, Zinfandel, and Syrah. Annual case production is around 5,000 cases. The family purchased the 36-acre property along Westside Road in 2004. A stone’s throw from both Williams Selyem and Rochioli, this is prime Pinot country. Part of the property was planted in 2007 as a new estate vineyard, featuring Swan, Mt. Eden, and Pommard clones of Pinot Noir. We all filed into the tasting room, and Leslie was surprised to see a bottle of Arista’s 2010 Gewürztraminer there, as that had been bottled just days before. Since it had already been opened that morning, it was a good place for us to start our tasting. The wine was fermented mainly in stainless steel with a small percentage being barrel-fermented. Although Arista is widely considered a Pinot Noir specialist, I’ve found they consistently make very good dry Gewürztraminer. We moved on from there to try a few of Arista’s Pinot Noir bottlings. I had tasted barrel samples of some of the same Pinots back in the spring of 2009, so it was interesting for me to taste the final bottlings and compare my impressions to the notes I’d taken nearly two years earlier. 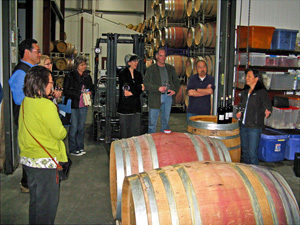 The Arista Pinots are not racked once they’re in barrel, and they’re usually bottled the August of the following year. 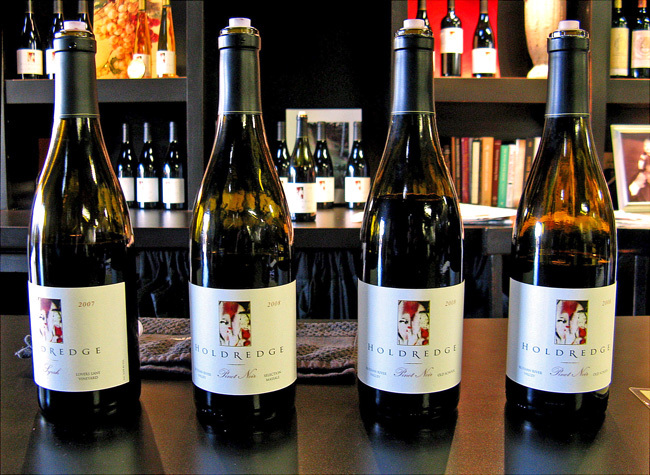 The Russian River Valley bottling is sourced from a number of vineyards, including Baci, Martinelli, and Bucher. 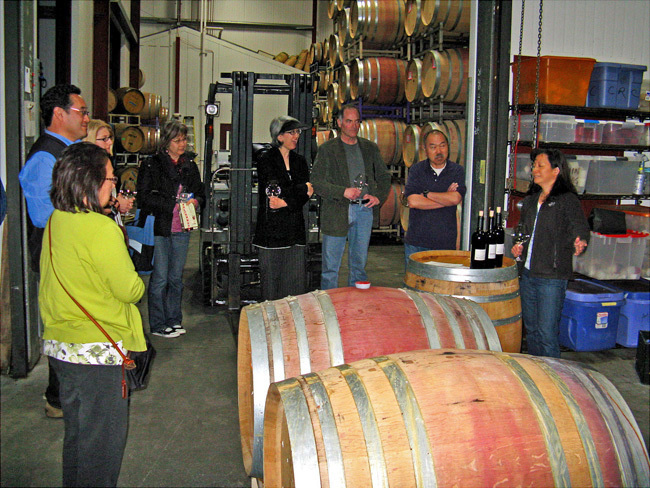 Leslie mentioned that blending wines is one of her favorite parts of being a winemaker. The La Cruz Vineyard bottling was one I’d never tried before – the vineyard is located near the Lakeville Highway in the Petaluma Gap area of the Sonoma Coast. The fruit from Bacigalupi vineyard comes from 30-year old vines, with older clones planted in a field blend style. Toboni Vineyard, just off of Olivet Road and River Road, is on a gently sloping site with fairly dense vine spacing. Perli Vineyard is in a remote hillside location between Anderson Valley and the Pacific coast. 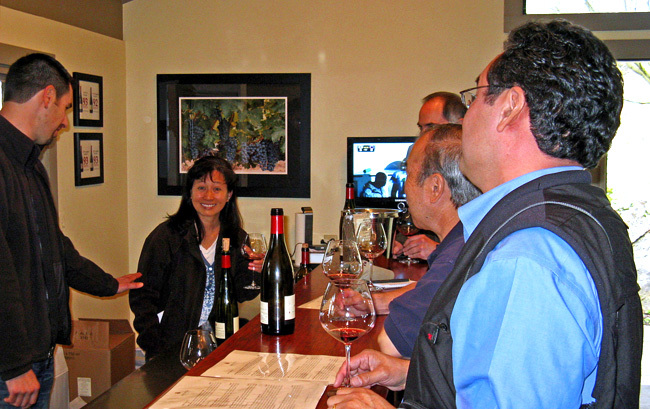 Leslie told us that she enjoys checking out different Pinot Noir regions, as each has something unique to offer. 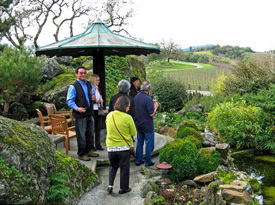 Since most of our group had never seen the lovely garden outside the tasting room, Leslie suggested that we head outside with our wineglasses and she would pour us the last wine of the tasting – a Zinfandel from Dry Creek Valley – in the garden. As we enjoyed the scenery, Leslie told us the story behind the tasting room building and garden. The Arista tasting room had been the guest house of the previous property owners, with the main house just up the hill to the west. The husband spent a tremendous amount of time developing the beautiful Japanese-style garden outside the guest house – to the point where his wife told him she would ask for a divorce if he continued to spend so much time there. The result was that he chose his gardening, she proceeded with the divorce, and sadly they both ended up losing the property. The McWilliams family was able to purchase the property just after this happened – fortunate timing for them. The Arista wines we tasted all showed quite well, even that just-bottled Gewürz. These are not shy wines, but they maintain elegance and balance that’s not always easy to achieve with the bold and tasty upfront fruit that they exhibit. The Toboni Vineyard Pinot was especially impressive. 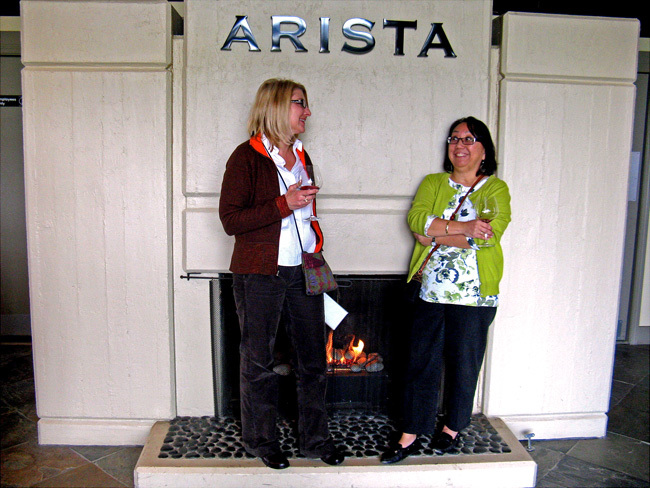 There are many fine wineries in Russian River Valley, and Arista has continued to move toward the best of the bunch. We said goodbye to Leslie at Arista, then drove north along Westside Road through Russian River Valley, continuing farther into Dry Creek Valley. Crossing another narrow old steel bridge across Dry Creek itself (which was not particularly dry this time of year), we stopped for lunch at Dry Creek General Store. The place was busy as usual, but we were able to stake out a table outside in the sun, where we could finally warm up as we enjoyed our delicious sandwiches and deli salads. Although I’d been a bit disappointed to learn that John Holdredge would not be able to meet our group the day we visited – he was pouring wine at an event in Southern California that day – I knew that it would be well worth a visit to taste his wines. John is a true character, and hopefully he’ll be around the next time I stop by. As with Arista, I’d visited Holdredge back in 2009, so more detailed notes on the winery can be found in the journal from April '09. 2008 “Old School” Pinot Noir, Russian River Valley: Medium-light ruby color, bright red fruit aroma with stemmy/spicy and floral overtones. Medium-light weight in the mouth with juicy acidity that leads to an almost tingly finish. This might be a candidate to cellar for the short term to let the acidity settle down a bit. 2008 Pinot Noir, Bucher Vineyard, Russian River Valley: Medium color, showing black cherry and dried herb with a touch of spicy oak. Medium-bodied but with more richness and texture on the palate than the “Old School,” while retaining a lively acidity. 2008 Pinot Noir, “Selection Massale,” Russian River Valley: Medium color, wonderful and intense aromas of exotic spices, a touch of earth, along with raspberry and black cherry fruit. Another medium-weight Pinot, this displays fine acidity and balance, with just enough tannins on the finish to suggest that holding this one for another year or two will smooth it out and make this even more enjoyable. 2007 Syrah, Lovers Lane Vineyard, Russian River Valley: Medium-dark purple color, there are floral notes along with blackberry, a hint of cocoa, and a strong spice component. Big but not heavy on the palate, with moderately tannic finish. 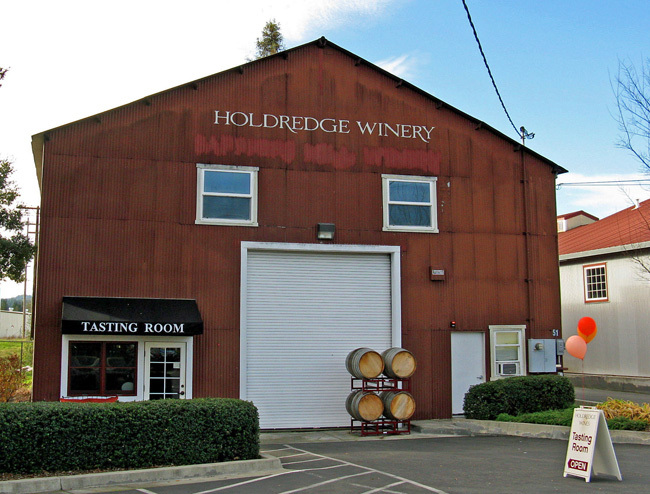 John and his wife Carri started Holdredge Wines about ten years ago, and annual production is now around 2,000 cases. A number of Pinot Noir bottlings make up most of the production, but John makes Zinfandel, Syrah, and some wonderful late-harvest dessert wines too. 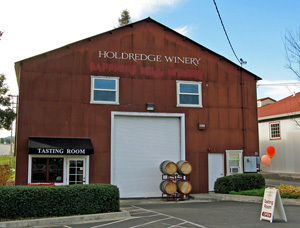 We dropped off a couple of people in our group to do some shopping near the plaza in central Healdsburg before proceeding to the eye-catching old red barn on the edge of town that houses Holdredge Wines. Cindy was the host at the tasting room for our visit, and she gave us a warm greeting. We got right down to business with tasting the four wines that were open that afternoon – three Pinots and a Syrah. The “Old School” Pinot Noir goes through 100% whole-cluster fermentation, and is foot-trod and basket-pressed. The 2008 vintage we tasted was only 13.2% alcohol. Like all the Holdredge Pinots, this is fermented with indigenous yeast. The Bucher Vineyard Pinot is sourced from a location on Westside Road, with alluvial soil. This was a deeper, richer wine that’s more typical Russian River Valley in character. The “Selection Massale” bottling uses a number of Pinot clones picked at the same time, and at different levels of ripeness, to gain complexity. I’d say this succeeded in a big way, and it was my favorite of the Pinots (and I think it was the consensus favorite of the group as well). The Lover’s Lane Syrah is co-fermented with 3% Viognier. Just as in my previous visit to Holdredge, I found the wines shared a style that emphasized brighter acidity than you find in most Russian River Valley wines. But that’s not to say that they’re lacking in aromatics or flavor – far from it. They show a clear focus in the winemaking, and have a distinctive, food-friendly character that helps them stand out among a crowded field from the area. As noted above, I thought the “Selection Massale” Pinot was a particular standout. After our stop at Holdredge, we picked up our two shoppers in central Healdsburg – after missing them and passing them by at first – and then drove back to Santa Rosa, where we headed west along Piner Road until we reached our last stop of the day at Inman Family Wines. As with our other winery stops of the day, I’d been to Inman in 2009, so more detailed background information on the winery and on Olivet Grange Vineyard can be found in the write-up from that visit in June '09. 2009 Pinot Gris, Russian River Valley: Light straw color, with bright citrus and herb aromas, this was crisp and fresh on the palate with a lingering, minerally finish. 2009 Chardonnay, Russian River Valley: Very light color, showing apple and pear in the nose with touches of vanilla and spice. The oak was well-integrated, and the rich, creamy mouthfeel was balanced by an almost racy acidity on the finish. Very tasty now, and should be even better in a year or two. 2007 Pinot Noir, Russian River Valley: Medium-light ruby color, displaying bright bing cherry, cranberry, spice, and dried herbs. Lighter-bodied and quite lively in the mouth, this would be a fine choice for near-term drinking. 2007 Pinot Noir, Thorn Ridge Ranch, Russian River Valley: Medium color, with loads of spice aromas along with black cherry and raspberry and a lightly earthy component. Elegant on the palate, with a touch of tannin on the finish. This has a more “Russian River Valley” profile than the leaner 2006 Thorn Ridge bottling. 2007 Pinot Noir, “OGV,” Russian River Valley: Medium color, this showed more intense aromatics than the Thorn Ridge, with black cherry, cola, spice, and distinct floral notes, plus some vanilla/oak that framed the wine nicely but was never intrusive. More lush mouthfeel than the Thorn Ridge, yet maintaining great verve and balance, and displaying a minerally edge. The finishing tannins suggest a few years of bottle age will be beneficial. A very fine Russian River Pinot. 2008 Pinot Noir, “OGV,” Russian River Valley: To be released in April 2011. A bit darker color than the 2007 bottling, this had more concentrated, riper fruit with bigger cola and spice components. Somewhat bigger and smoother in the mouth, this is a delicious wine already though it may not have the structure of the 2007. Still young, this wine does deserve more time to show its best. A new winery / tasting room building has been added since my last visit, and it’s a handsome structure, built largely with recycled materials. From solar panels on the winery roof, to recycled wastewater for use in irrigation and frost protection, to using compost made from table scraps from many fine San Francisco restaurants, the winery and vineyard are operated in a very eco-friendly manner. 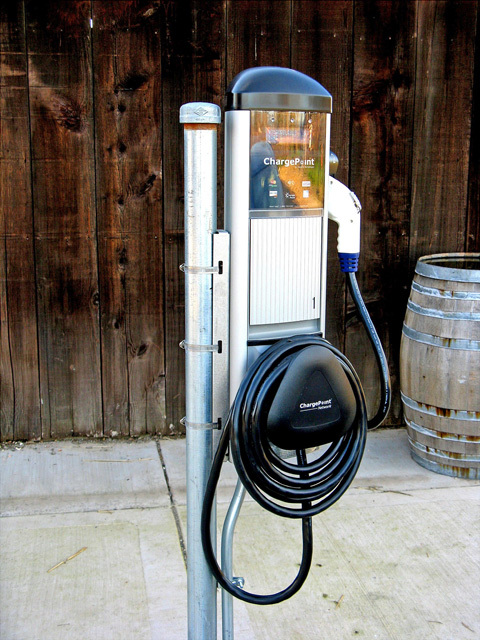 In fact, one of the first things I noticed after pulling into the Inman parking area was an electric vehicle recharging station installed there. 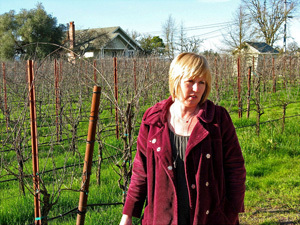 Kathleen Inman is a wine country native, and her grandparents grew prunes in Napa Valley. She and her husband Simon bought their property, just a few miles west of Santa Rosa, in 1999. The following year they planted their 10½-acre vineyard, which they named Olivet Grange. The vineyard is planted mainly to Pinot Noir (clones 114, 115, 667, 777, and 828) plus a small amount of Pinot Gris. The soil is primarily sandy loam with gravel. Although Kathleen farms their vineyard organically, she has been hesitant to have it certified organic due to the red tape involved. She practices dry-farming as much as possible, although compost teas are carried to the vines through the drip irrigation system. Kathleen told us that she was getting ready to prune the vines, and that she schedules pruning and many other vineyard activities according to the lunar cycle. 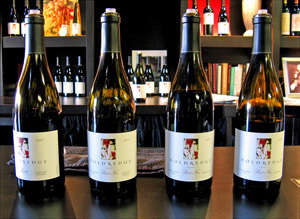 Inman produced their first wine, a Pinot Gris, from the 2002 vintage, followed by Pinot Noir in 2003. They also make a Pinot Rosé, and they added a non-estate Chardonnay to their line-up in 2008. The ultimate production target is about 3,500 cases, though the 2008 vintage was a smaller one due to considerable frost damage in their vineyard that year. Inman bottles all their wines under screwcap. Kathleen told us that she likes screwcaps for retaining the fresh aromatics of her wines as well as for more consistency from bottle to bottle than with cork closures. The day had warmed up considerably since the chilly morning, and Kathleen suggested starting off our tasting outside in the sun, so we settled into some comfy seats just outside the new building. After awhile, it actually got too warm for us out there, so we headed into the tasting room to finish our tasting. 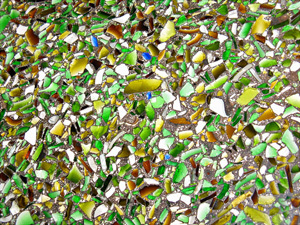 I couldn’t help but notice the distinctive countertop of the tasting bar – Kathleen told us that it was made with recycled pieces of old wine bottles. 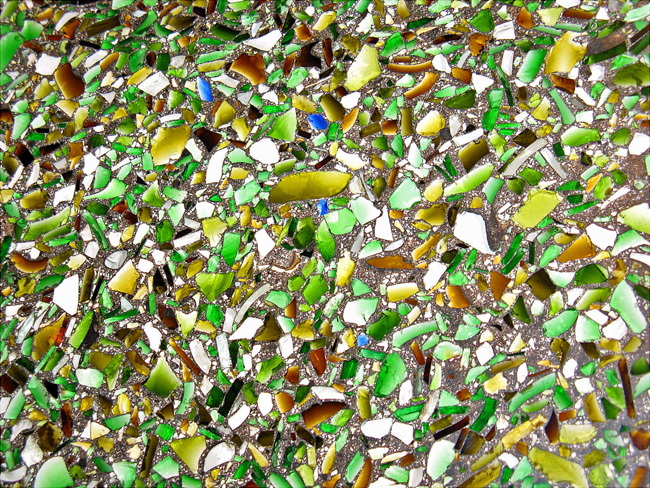 A clever idea resulting in a very attractive countertop! The 2009 Pinot Gris is sourced entirely from Olivet Grange Vineyard fruit. The fruit for the 2009 Chardonnay was picked at very high acidity (over 1.0 TA), and was sourced from one vineyard near Sebastopol and another one very close to the Inman’s property. The Chardonnay is made in 50% stainless steel barrels and 50% new French oak, with indigenous yeast and malolactic culture, and goes through a complete malolactic fermentation. The Russian River Valley Pinot bottling is made from fruit grown both at the estate Olivet Grange Vineyard and at Thorn Ridge Ranch, in the Sebastopol Hills area. Inman gets Pommard, Swan, and 777 Pinot clones from Thorn Ridge, which is farmed by noted grower Ted Klopp. The “OGV” Pinot bottling is from 100% Olivet Grange Vineyard fruit. Multiple picks from the vineyard are vinified separately as field blends of all the clones, and barrels from these lots are then blended later. The Pinots spend about 17-18 months in barrel, more than many California wineries barrel-age Pinot these days. The Inman wines were a pleasure to taste. One thing that struck me in particular about them was the differences that were apparent between the current wines and the previous vintage I’d tried a couple of years earlier. Kathleen has allowed the nature of each vintage to speak for itself. I think the fact that her wines tend toward the lighter side for Russian River Valley helps bring out these distinctions. The Pinot Noirs in particular show both focus and finesse, and they’re certainly some of the finer ones from this area that I’ve tasted recently – the 2007 “OGV” Pinot was especially impressive. It was late afternoon by the time we finished our tasting with Kathleen, so we decided to call it a day and make the drive back to San Francisco. I enjoyed revisiting several wineries I’d been to a couple of years earlier, and I think my friends had a good time trying many wines that were new to them and meeting such fine winemakers and wonderful hosts along the way. As always, thanks to everyone that we visited for being so generous with their time and their wine!